FILE - Cambodian garment workers sew clothes in a factory in Phnom Penh, Cambodia, Aug. 4, 2007. 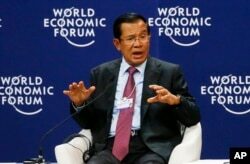 In the lead-up to Cambodia's July election, Hun Sen claimed defense of the national sovereignty necessitated the banning of the opposition Cambodia National Rescue Party — which he said was made up of agents of malicious foreign governments — and the jailing of its leader Kem Sokha. 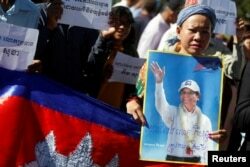 FILE - Supporters of Kem Sokha, leader of the Cambodia National Rescue Party, stand outside the Appeal Court during a bail hearing for the jailed opposition leader in Phnom Penh, Cambodia, Sept. 26, 2017. FILE - Prime Minister Hun Sen of Cambodia gestures as he talks about his vision for the Mekong region in the World Economic Forum on ASEAN at the National Convention Center in Hanoi, Vietnam, Sept. 12, 2018.